After reading an article regarding wildfires across Washington State, the issue of seasonal natural disasters has come to significant attention. The “Sleepy Hollow Fire” in Wenatchee is called a “war zone” by residents, and it has already burned 24 residential houses, 4 businesses, and has expanded to 3,000 acres. Luckily, there have been no serious injuries– the police have evacuated homes in danger of burning. This fire has demolished family tradition and history, as well as home net worth– some houses were valued up to $1.5 million. As for the business fires, one building leaked ammonia during its burning, which poses more safety concerns for the local Wenatchee residents. A large antagonist to the current Washington wildfires is wind. With winds reaching up to 20 mph in Wenatchee, fires spread quickly and with ease. Already, more than 150 residents are either without a home, or are sent to sleep in communal areas for their own safety. The local firefighters (70% volunteers) are reported to be quite exhausted, and with temperatures approaching 90 degrees in the next couple days, the Wenatchee fire has an even greater potential to spread. According to the National Interagency Fire Center in Boise, there are currently 80 major fires burning in the West. The Paradise Fire, located in Olympic National Park and caused by lightning, has already burned 1,000 acres of natural forest. The Saddle Lake Fire, close to Wenatchee, has already burned 3,000 acres. The Les Blair Fire, near Kennewick, has burned over 2,000 acres. There are also arising fires in Orondo, Mansfield and Waterville in Douglas County. After considering the growing wildfire conflict in Washington State, it is important to practice safe procedures to avoid potential fires in your home. Be sure to contact your local insurance agent to review your home insurance coverages, and make sure your policy is up to date! It is important to keep in mind your surroundings when setting off fireworks. 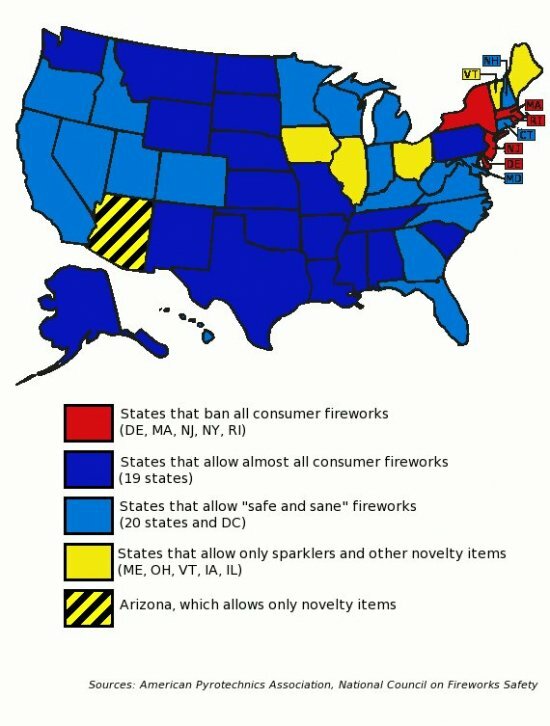 Also be sure to consult with local authorities to see if the type of fireworks you own are allowed to be set off. Be attended at all times by an alert individual and equipment capable of extinguishing the fire. Please note – the use of gas and propane self-contained stoves and barbeques would continue to be allowed under the ban. For properties located within cities, please contact your local jurisdiction for requirements. The last factor one must keep in mind during Fourth of July Weekend is the use of sparklers. According to WWLP News, sparklers can get up to 1200 degrees Fahrenheit! This temperature is almost 2 times as much as the temperature required to burn wood, which certainly makes for a huge fire and safety hazard. While sparklers are often overlooked as lighthearted fun toys, these small sticks of snap, crackle, and pop are more hazardous than one imagines. Please use extreme caution and safety when handling sparklers, and provide even more supervision when given to youth! We hope you all have a wonderful (and safe!) Fourth of July Weekend! P.S. There will be complimentary coffee and pastries at Magnolia Insurance Agency next Wednesday, July 8th, 9:30-11:30am! Come swing by; we would love to hear how you celebrated Fourth of July. Does My Auto Policy Cover a Rental Car? Your auto insurance policy will typically protect you in a substitute vehicle (or a rental car) “to a certain extent”. For instance, if you have a $500 deductible on comprehensive and collision coverage, the rental car would be covered with the same deductible. BE AWARE that your personal auto policy does not cover vehicles over a certain size (some U-Hauls, trucks, etc.) your travel outside the United States, or drivers not listed on your policy. SHOULD YOU PURCHASE THE LOSS DAMAGE WAIVER (LDW)? 3. Diminished value – decrease in the value of the vehicle due to the damage the vehicle has incurred. If you have comprehensive and collision coverage on your auto policy, it will extend to a rental vehicle with the same coverage and deductible that you purchased on your auto policy. It will NOT cover LOSS OF USE AND DIMINISHED VALUE. Without the LDW, you would be responsible for your deductible, loss of use and diminished value of the rental vehicle and that can mean thousands of dollars and a lot of time and disruption on your part. For car sharing and peer to peer car rental services, the coverage is not standardized. It is important to go to the company website and read the insurance coverage information carefully. If you have any questions at all, call the customer service number. Most importantly, please call any of us at Magnolia Insurance Agency if you have any questions before you rent a vehicle. Your assets are on the line, and we are here to help you protect them properly! Vehicle theft is an issue many are aware of– we lock our cars, remove valuables, and try to park close to the respective building. However, every once in a while, one forgets to follow this procedure, and this mistake can lead to car theft, or even worse. According to Insurance Journal, in 2014, the Seattle-Tacoma-Bellevue metro area was the 8th most common region for vehicle theft in the nation, at 20,268 thefts. This number has increased from 2013, in which this metro area was ranked the 13th worst in the nation at 18,128 thefts. Overall, apart from California, Washington State appears to be the 2nd most common state for vehicle theft. Make sure to keep your assets hidden or protected, and always lock your car when leaving! You see the red flashing lights, look in the rear view mirror and realize it is YOUR car that is in question. Since traffic tickets are one of the factors with the greatest impact on insurance premium, especially for young drivers, I want to share some information that I learned from a traffic attorney. This information will help you understand your options so that you can keep your insurance coverage high and your premium low. When you receive a traffic ticket in the State of Washington, there are three options on the ticket from which to choose: PAY, MITIGATE, or CONTEST. PAYING the ticket means that you admit to the alleged violation and you would like to pay the fine. It is an easy solution, however, the cost of you increased insurance premium for a minimum of three years can be much greater than the fine itself. That’s when mitigation may be a better option. MITIGATING the ticket means that you admit to the alleged violation, but you would like to explain the circumstances in an effort to reduce the amount of the fine. In the State of Washington, you may even chose to DEFER your ticket once every seven years if it is considered a minor infraction. CONTESTING the ticket means that you do not admit to the alleged violation and you want to fight the traffic ticket. You can contest a traffic ticket without an attorney, however, your chances of winning decrease dramatically. Traffic tickets are dismissed or found not committed due to a combination of knowledge of the particular court, and knowing the right arguments to make in front of a particular judge. Pay, Mitigate, or Contest. Know the options and chose the solution that works best for you! Thank you for the referrals! I truly enjoy working with your friends, associates, and relatives. Remember, we have Starbucks cards, iTunes cards, and car washes for each referral!